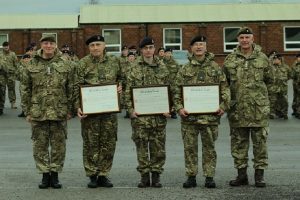 A unique event in Lincolnshire Army Cadet Force’s 102-year history took place at Beckingham Training Camp on Saturday. In front of 130 cadets on their Basic Training weekend, the County’s three padres received their Cadet Force Commission scrolls signed by HM The Queen. Colonel Geoff Newmarch, the Honorary Colonel of Lincolnshire Army Cadet Force made the presentation to the padres, who are members of the Royal Army Chaplain’s Department. The commission brings the padres in line with other officers in the ACF. In addition to their spiritual role, the padres are key in delivering welfare support and understanding and dealing with the needs and issues affecting the cadets and adult volunteers alike. As many past and present cadets who have attended the 2-week summer camp will testify, the padre’s evening quiet hour, with hot cocoa and a biscuit, is very popular. Rev Gareth Atha really values the Cadets as it allows him to mix with people who might not normally be in church. 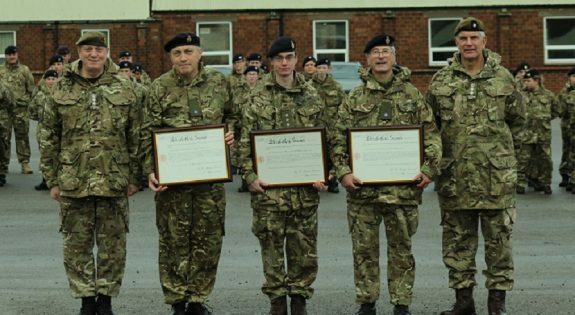 He said: “the new commission, recognises what we do and emphasises that we are very much part of the Army Cadet Force. It brings us more closely in line with other ACF officers than we were under the old commission with the Army Chaplain Department, which we are still part of. Rev Goalby, whose retirement is drawing close, is sad to be leaving the ACF. He says he’s been with Lincolnshire ACF since 2004 and will certainly miss ‘getting muddy’ on fieldcraft exercises, together, of course, with strumming his guitar and singing a few songs! At Beckingham, the padres witnessed new cadets experiencing Basic Training. Over the weekend, the youngsters were introduced to communal life and barrack room routine and undertook training in drill, turn out, first aid, leadership, military knowledge, navigation and physical training. In addition to being more self-reliant and self-confident, as always, the new cadets made a number of new friends.